Interceptor® Flavor Tabs are a palatable once-a-month tablet that prevents heartworm disease, controls adult hookworms, and removes and controls adult roundworms and whipworm infections. Interceptor for cats is the only oral monthly preventative that protects against heartworms and removes adult roundworms and adult hookworms. Interceptor requires a prescription from your veterinarian. How it works: Interceptor Flavor Tabs eliminate the tissue stage of heartworm larvae and the adult stage of hookworm, roundworm, and whipworm infestations. The anthelmintic activity (destroying parasitic worms) of the active ingredient milbemycin oxime is believed to be a result of interfering with the invertebrates neurotransmission. Dosage & Administration: Give Interceptor exactly as directed by the veterinarian. If you do not understand the directions ask the pharmacist or veterinarian to explain them to you. Heartworm testing should be performed prior to the start of prevention therapy. If the animal is off Interceptor for 6 months or less, start the medication and test after 6 months since microfilaria, that take 6 months to mature, will result in a positive test result. Store Interceptor at room temperature. Do not remove the tablet from its wrapper until ready to give the medicine. Keep this medication away from children and pets. Interceptor is safe for pregnant or lactating pets at a normal dose level. Watch pet closely following dosing to be sure the entire dose has been swallowed. If it is not completely swallowed, give one more full recommended dose as soon as possible. What happens if I overdose the pet: Seek emergency veterinary medical treatment. Symptoms of overdose may include depression drowsiness, vomiting, loss of appetite, diarrhea, hypersalivation, seizures and weakness. What should I avoid while giving Interceptor to my pet: Because humans can contract hookworm and roundworm from animals, it is important to maintain good personal hygiene. It is also important to eliminate fleas on the pet and in the househand to not feed the pet rodents or uncooked meat or fish. To prevent reinfection, daily cleanup of stools is recommended. What are the possible side effects of Interceptor: Side effects of Interceptor are rare although some animals may exhibit depression, drowsiness, vomiting, loss of appetite, diarrhea, hypersalivation, seizures and weakness. If these or other symptoms develop contact your veterinarian. 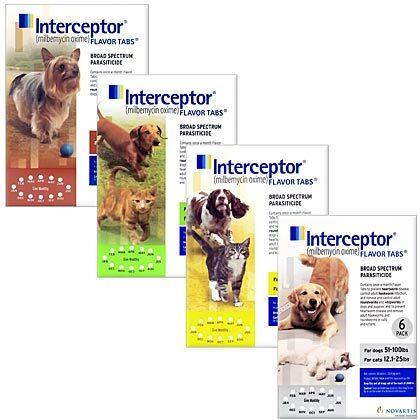 What other drugs will affect Interceptor: While Interceptor is safe to use in dogs at risk for MDRI-allele mutation (Australian Shepherds, Collies, Shelties, etc. ), unless tested normal, caution is advised if the pet is also being given amiodarone (Cordarone), azole antifungals such as ketoconazole, carvedilol (Coreg), cyclosporine (Atopica), diltiazem (Cardizem), erthromycin (Ery-Tabs) or clarithromycin (Biaxin), quinidine, spironolactone (Adlactone), tamoxifen, and verapamil (Calan). Do not give Interceptor to your pet if already taking an alternate heartworm medication. What should I discuss with my veterinarian before giving Interceptor to my pet: Tell your veterinarian if your pet has ever had an allergic reaction to Interceptor or milbemycin. Cautions: Side effects of Interceptor are rare, but some animals may show signs of depression, drowsiness, vomiting, loss of appetite, diarrhea, hypersalivation, seizures, and weakness. If these or other symptoms develop contact your veterinarian. Since humans can contract hookworm and roundworm from animals, you should maintain good personal hygiene. To prevent reinfection, cleaning up stool daily is recommended. Don't give your pet Interceptor if you are already administering another heartworm preventative. Ordered, they got in touch with my vet, and got order very quickly. I gave already referred to my daughter. This was my first time doing a mail-away prescription order, but my experience was great! As soon as the hard copy of the Rx was received they shipped the package within a day. I called a couple times to see if the Rx had arrived (I was nervous mailing the original across the country), and each time the reps were nice and helpful. There was a free sample bag of pill pockets sent with the order, which was a really nice surprise since I thought Interceptor was a chew tab, but it's actually a small pill. ProsLess expensive than Sentinel and my vet said my dog didn't need the added dewormer - glad to remove an unneeded chemical where I can with Interceptor. ConsTemporarily living in AL, but they were unable to ship there, so I had to have the package delivered to my parents' in another state. My dog was previously on Sentinel, which was a chew tab my dog ate like a treat and I was expecting this to be the same, but this is a small pill that he would not by itself. Great to see Interceptor is back on the market again. My dogs used this product for years,until it had issues and was no longer sold. My dog did not like the new one, we had to buy and I had to cover it in peanut butter. This one, my dog just eats it with no problem. Even my newer dog, who didn't mind the new one, likes this one just fine. It is the perfect product for dogs who can't have certain other products, due to have collie mixed in the breed. ProsGlad to see this product back. Dogs take it easily. Especially good for Australian Shepherds and Collies. Starting using this product, after other heartworm preventative was on and still is on back order. Quick delivery of product. Helpful with what was required on prescription, that needed to be sent for product. Entirely Pets had the BEST price for this product. Geeat product with prompt shipping. The only delays or experienced when my that did not respond and entirely pets pharmacy was very good at keeping me abreast of the process. The boxes were crushed, but the pills look okay. I haven't used it yet, but I'm happy that Interceptor is available again.